If a lawsuit occurs, and a professional walks into a court room with their seal on the line, they aren’t throwing a model on the table as “Exhibit A” for their defense. They’ll throw the signed, stamped and sealed drawing. I appreciate the art of the drawing, the simplicity of a piece of paper communicating complex ideas and perspective…but Drawings aren’t going to die soon…not because Models or Simulation can do it better…but because (at least in the USA), each individual state requires a signed, stamped and sealed drawing as the legal document on a project. Every project, from the backyard addition or deck to the 200 story hi-rise, to the 20 mile road/corridor creation, to the parking lot paving in your neighborhood. Drawings aren’t going anywhere until that requirement goes away…and even then, I don’t necessarily seem them going immediately after. your review has convinced me not to buy and/or read the book. I.M.Pei’s who are being given awards and published heavily. such as we saw in the 60s, 70s, 80s? Thank you for taking the time the read and review my book. As they say, there is no such thing as bad publicity. Nevertheless, you make some comments I think are not supported by the book itself. The context, the lack of which you criticize, is in fact provided in economics. BIM and certain uses of computational design owe their current prominence to the economic interests of building owners, which is clearly stated and the NIST report cited. If I had cited “reality hunger” as the main cause of the ascendance of simulation in architecture, then I would have had a difficult argument to make indeed! I provide further (actually, more detail on the same) context by making the point- at length- that drawings are being superseded because they became inadequate to the task of documenting modern buildings. Indeed, as you say, drawings “don’t work” any more. However, “working” in the sense of providing sufficient information for construction, has been only one of drawing’s roles in architectural culture, and its failure in this one regard takes the rest down with it. You evidently took away from the book that I am anti-simulation, in spite of the fact that you quote me to the effect that the question of whether simulation is bad or not is not a real question. I was afraid this would happen and was warned about it by a few of the people who read drafts. I thought I had it covered. I guess not. For the record, I’m not anti-simulation. I want people to think about what it entails for design and construction. I say very clearly that there is no prospect of turning it back. If I emphasize the qualities of drawing that are absent in simulation, it’s because I believe a large part of my readership (most architects under 40) will not be familiar with them. 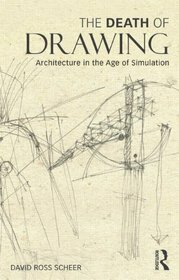 The replacement of drawing by simulation has not already happened as you claim. As you well know, drawings still serve as essential contract documents on virtually every project in the world. Many people (including me) expect that they will eventually be replaced by electronic documents, but there are many serious obstacles to this actually happening. As long as drawings are the chief product of our software (and vendors continue to design their software with this end in mind), we will continue to rely on the conventions that govern them in our work. I do think faulting the book for a lack of evidence is fair to some extent. I ground my critique of simulation in the work of well-respected philosophers and discuss current practice extensively to identify where and how simulation is having effects. But the book as a whole is a thesis intended to spark discussion. This requires making the thesis plausible, which I hope I do. Concrete proof- case studies, etc.- would be another book. As far as referencing other relevant works- Graves’s article hadn’t appeared when I submitted the text to the publisher. I attended the Yale symposium “Is Drawing Dead?”. As with most symposia, few of the presentations really addressed the topic. One exception was Mario Carpo’s contribution and I do refer to his written work. I wish I had found Mitchell’s 1989 article- I will read it now. However, given the hundreds of books and articles I do reference, missing one doesn’t seem too bad. Do I really have to prove that drawing has been a hallmark of the architectural profession? If so, don’t the drawings prove it? Since the book is about drawing and architecture, is it relevant that there have been other such hallmarks? I don’t say, or need to say, that drawing is the only one. The fact that LEED is poor at predicting building performance only means that it is a poor simulation, not that simulations in general don’t work. Finally, saying “representation and simulation are incompatible” does not imply that I think representation is superior. At any rate, the debate I hoped the book would spark has started. Thank you for your response. I respect your opinion very much and look forward to continued conversations. Architects have infused their designs with meaning for ages. But drawing is not the only means by which meaning is actualized. In fact, as with all communication, meaning is a two-way street: the building user and the public at large have some say in the matter. And the meaning they interpret may not be the meaning the architect intended. A great deal of a building’s meaning is acquired not through any effort on the architect’s part, but on the building’s immediate context.